The industry leading water filled cofferdam / temporary dam system in continuous manufacture for over 25 years. Our design emphasis is all about safety, ease of use and quality. Our business is all about customer service and successful outcomes. 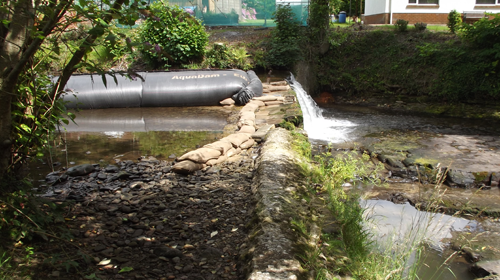 Your temporary dam needs can be met at reduced cost from our stock of AquaDam SpeedyDams - straight line cofferdams, 3 sided cofferdams and flumes. The Speedy range comes in two size models and a range of standard lengths from 5m to 25m. Specifically designed with user installation in mind allowing you to retain full control of cofferdam costs and schedule. If you need onsite installation assistance we have an AquaDam Experienced User Service available delivered by AWS (AIRS) Ltd.
Next day despatch, from £499.00 / €580,00 (excl. VAT / TVA & delivery Speedy 5/70). AquaDams is designed with open-ended fill tubes. This makes for rapid emptying and removal as compared with fill port type systems. The woven geotextile construction delivers vastly superior tear propagation resistance characteristics as compared with other materials such as PVC.